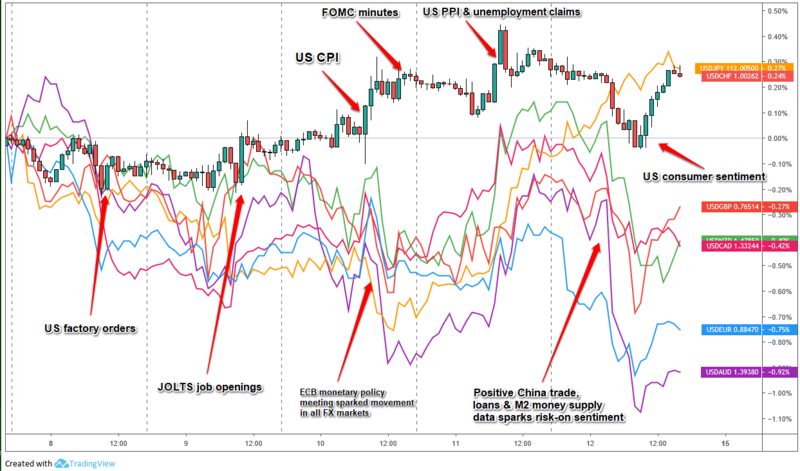 A relatively quiet week for the Greenback, but the bears were mostly in control, likely on euro strength and other counter currency/global risk sentiment influences. European Central Bank holds interest rates amid gloomy economic outlook – This event likely helped contribute volatility to the Greenback as well as the euro is heavily traded against the U.S. dollar. Euro strength may be the reason why we saw USD weakness despite the improvement on headline consumer prices data. China’s March trade surplus soars past expectations and China’s new yuan loans expand in March – This data sparked global risk-on sentiment, likely lifting oil prices and risk assets with it. This is most likely the reason why we saw the U.S. dollar able to finish in the green against the safe have currencies (JPY & CHF) while falling against the high-yielders (NZD, CAD & AUD) and the relatively strong euro.